Do you dream of becoming a writer but you can’t get past that fear of being rejected by critics? Are you afraid of hitting the publish button because of what others might think? Do you struggle to explain why you write? The truth is, writing is hard work. But the real problem begins before you write anything at all. Wrapped up in the fear of what people will think and mired in personal self doubt and uncertainty, you destroy your art before it has a chance to develop and grow. This can all end today. Become the author you are dreaming to be. If you want to become a successful author, dealing with the pressure of rejection and criticism is a real fear. Whether you are an aspiring author or a seasoned veteran in publishing, confronting personal rejection is the most fearful aspect for many writers. In Rejection Free For Authors, multiple bestselling author Scott Allan gives you the practical confidence to move you from fear to published author. If you have the desire to write, but you’re held back by the blank page syndrome and the fear of being rejected or criticized, this book is for you. Get over the fear of writing that first page. Understand the psychology of rejection and how it impacts you as an author. Stop the comparison game and be the creative author you’ve always wanted to be. Become more transparent and reach your audience. Overcome the self-doubt keeping you stuck. 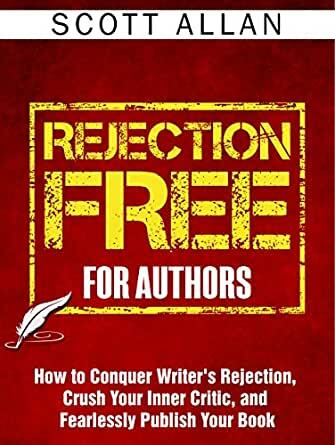 Rejection Free For Authors is a practical, no-holds-barred book written to empower authors to break through fear, eliminate perfection, and write the books they love. Punch out your inner critic when it gets too loud. Create your writing routine for greater productivity. Learn to deal with critics and bad reviews. Make writing a daily habit so you can build up your confidence and create a powerful passive income funnel. Imagine where would you be if you could navigate through the self-rejection, fear, and doubt that’s holding you prisoner? Crush the fear of rejection and fearlessly publish your book. By the time you are halfway through Rejection Free For Authors, you’ll be itching to get your writing on track. You’ll be less fearful of the process and armed with solid strategies on dealing with rejection and uncertainty. Download Rejection Free For Authors today by scrolling up and hitting the BUY NOW button at the top of this page! Scott Allan writes books that focus on changing old routines, overcoming self-defeating behavior and the best strategies on dealing with rejection. He believes that successful living is a series of small actions taken consistently on a daily basis in order to build an empowering and freedom-based lifestyle. Scott resides in western Japan where he spends most of his time traveling, writing and counting the many gratitudes of life. He is the author of Empower Your Thoughts, Rejection Reset and several other bestselling books. With a deep passion for teaching, building life skills, and inspiring others to take charge of their lives, he is committed to a path of constant and never-ending self improvement. 5.0 out of 5 starsThank goodness someone gets it! Thank goodness someone gets it! The timing for this gem is perfect, as I'm soon to publish my very first book, and have been feeling a lot of mixed emotion around it... Now I feel more confident to move forward and share a little of me with the world. Thanks Scott Allan for being a best friend for authors! 5.0 out of 5 starsLessons all authors need to learn. I still remember the fear I had in writing my first book. Even after writing several books thereafter, those unwelcome thoughts of “Will anyone like this” still enter my mind today. It was for this reason that I wanted to read Scott’s latest book. From his previous books, I knew he was very real and down to earth, so I had high hopes from his latest release, and I wasn’t disappointed. His writing is very easy to read, and he’s not afraid to be vulnerable and share about his own struggles with trying to overcome fear and rejection. What I liked about it is that there’s so many books on how to publish a book, but very few on overcoming the emotional doubts that most budding authors get as they start to write. So Scott goes through and outlines the many fears people have in writing their book, then he shares many practical ideas that help give you the confidence to keep writing and eventually publish your book. As with all of Scott’s superb books the only sure way to benefit from his advice is to read and re-read his words. For brevity’s the subjects he addresses are The Journey of Rejected Authors, Now is the Time to Defeat Your Fears, The Dream to Write a Book, The Psychology of Rejection, Analyzing Rejection: Who is Rejecting You?, The 7 Benefits of Learning to Handle Rejection, The Traits of Successful Authors, Leverage Rejection to Your Advantage, The Excuses Why We Don’t Start Writing, The Seven Reasons Authors Fail, Giving Yourself Permission to Be An Author, Write What You Love and Build Author Identity, The Struggle With Transparency, Embracing Uncertainty and Facing Your Writing Fears, Create Your Writing Space, Stick to a Writing Routine, Building a Foundation for Bulletproof Confidence, Strategies for Beating Procrastination, Get Your Writing Done, Get Over the Fear of Shipping, Done Is Better Than Perfect, Embrace Perfection and Punch Out Your Inner Critic, Bad Reviews, Naysayers, and the Critics, The Fearless Approach to Marketing Your Book, and Writing Beyond Rejection. 5.0 out of 5 starsA must read for aspiring authors and seasoned writing veterans! “We often reject ourselves more than anyone else does.” This is one of my favorite quotes from this excellent read for aspiring authors and seasoned veterans alike. It is especially valuable for authors who long to silence their inner critic and push past their fears of rejection. For me, this book was an excellent reminder that I am not alone in my my fears. I especially enjoyed reading about the seven benefits of overcoming one’s rejection fears and appreciate the tips for handling negative reviews. It was also inspiring to read about how others pushed pasted their writing anxieties and multiple rejections to eventually find massive publishing success. This book makes me feel that I can push past my writing and rejection fears too. 5.0 out of 5 starsAnother Exceptional Book by Scott Allan. I love Scott Allan's brilliant and intelligent writing. I have purchased many of his books and can't get enough of his great advice. If you've never read any of his works, be sure to pick up this one. It will motivate and encourage you. Writing is a lonely and discouraging craft. Rejection by others is real, but rejection by ourselves is worse. We look at our writing and think, "Who would ever want to read my garbage?" I threw my first manuscript in the garbage and the fear of publishing almost terminated my next one. Scott Allan's book "Rejection Free" help me break through in some very difficult times of writing. I'm really pleased that he has produced this book specifically for authors. Mr. Allan's writing style flows well, is easy to understand and connects with the reader's deepest pain points. This is a book that I will read again and again to help me get through those dark days when I feel unworthy, unloved and rejected.